Fellowship Reviews: For What It's Worth: Happy Birthday Star Trek! For What It's Worth: Happy Birthday Star Trek! 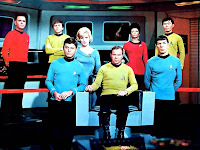 45 years ago today (and it was a Thursday), Star Trek premiere on NBC. Creator Gene Roddenberry sold the executives a concept of "Wagon Train to the stars," but it was oh so much more than that. It's hard to believe now that the show was cancelled twice. Only the letter-writing of the fans help give us a second and third season. The franchise spawned an animated series (and talk of another one), four other live action series, eleven movies, and millions of fans all over the world. The show was so daring - a multi-cultural and racial crew, it touched topics that no other show would but was able to disguise it with the Sci-Fi dressings. The technology of the show we're starting to see here and now (think about your cellphone, iPhone, Android, etc. and not think about Trek's communicator or tricorder. Gene isn't with us anymore, but his legacy is still going strong. What better way to end this than with the Vulcan greeting "Live long and prosper."